I made this cover as a goof on a couple of characters that had the unfortunate timing to try and capitalize on dance crazes just as those fads were ending. 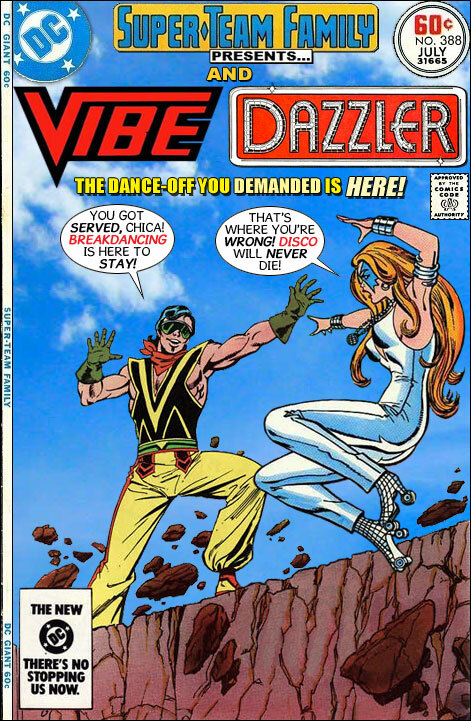 Little did I know that before I had a chance to post this, Vibe would actually be revived and given his own ongoing title! I think that's pretty cool, because I have always been of the opinion that any character can be a success if given the right angle. Hopefully, he will meet with more success this time out. Ha! That's a great cover! I would hope that Vibe gets a better groove than Ryan Choi and Jaymie Reyes. By any chance did you get to see the DC Nation Vibe short? Pure 80's animation homage. Yeah, great stuff, and that's where I got the logo from. Not to crow, but I took the Vibe logo from out of Who's Who and coupled it with a Thomas Derrenick drawing. The animators then took that fan piece off the internet and used it as inspiration for their title sequence. It was rad chill, 'yo. I think the much younger writers and artists currently working for DC and Marvel (contractually) are much more in tuned with current pop culture and therefor less likely to make such embarrassing gaffes as the olde timers did back in the '70s and '80s. Checkout DC's new title The Movement, which seems loosely based on Occupy Wall Street/Anonymous. Young politically radical hipsters with mutant powers, but they don't look corny!! Now if only we had a super-powered Lady Gaga type hero!!! .....or a heavily tatooed, Lil Wayne-type rapper/rock star who actually IS an extra-terrestrial!! Maybe not. I've got a lot of love for Vibe. The Detroit Justice league was an end of an era for me, as I shortly went off the college and ceased collecting comics (but still perused issues as hobby shops). So Vibe (and Wild Dog) were the last new heroes I read about before, well, growing up. Dazzling!!!!! (I couldn't resist!!!) But how about utilizing some Classics Illustrated covers? Batman and David Copperfield, anyone??? ?